The Boys from Boston are coming in with something to prove, and there is nothing more dangerous than a group of committed individuals that feel a bit slighted. When you compare the stature of Mass against most MRDA teams – they do look generally small. 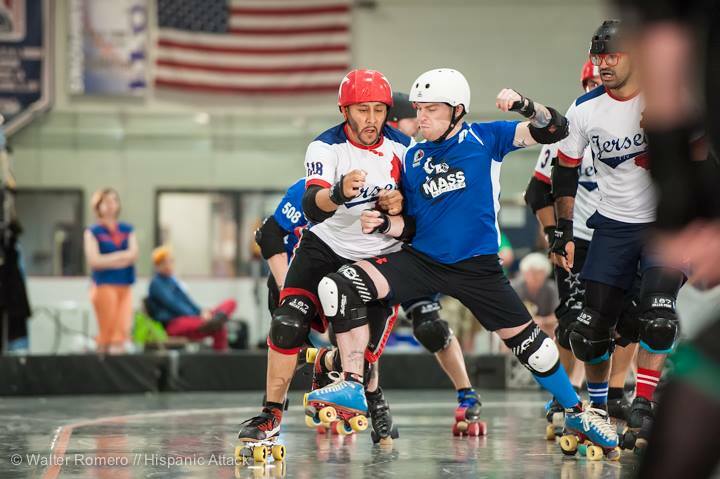 Critical pack directors Terry Hasselmann (Peter Rottentail), R Pickering (Smiteochondria), and Mars Travolta are average height (at best) and certainly not hefty – they rely on deftness of movement to even the odds against opposing jammers. Overall, a fluid diamond formation or “around the world” style of play is very present in the Maelstrom blocking strategy, in order to give every blocker the best chance of leveraging their body weight against bigger opponents. Jammers like Cilantro and No Big Deal are not breaking any height barriers either. NBD uses brute force and quick, hammering edges to break packs wide open while John Collentro (Cilantro) falls back on pure acrobatics to obtain lead jammer (The kid is made of silly putty, I swear). Wes Turn (Conlin) uses his edge to block during the Mohawk Valley Cup. Photo by Hispanic Attack. Ok, side note: you’re probably wondering why I’m using up your valueable time with making you read multiple names for all these guys. There was actually a bit of confusion during Champs last year for those streaming the Maelstrom bouts. 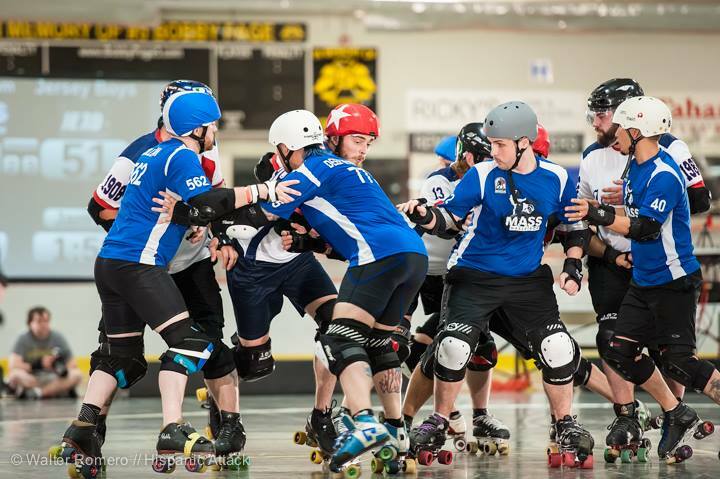 The rosters were submitted with derby names, but [most of] the jerseys have real names on the back. Viewers at home weren’t sure which skater the announcers were talking about based on jerseys, and the announcers even confused themselves during their commentary. Why the real names? Some of the guys are just done with derby names (I know a certain bunny who is particularly done with cheek of the fake names), while others see it as a way of really claiming the work they put into their skating and into their league. They are all very proud of what they do with Maelstrom and with smaller leagues in the greater Boston area; using their real names brings them a sense of professionalism and ownership for their accomplishments. Alright, I’m back from the tangent. 2014 has been the season of ‘injures and real life’ for the Vikings of New England. The acrobatics of Jurasskick Park as captured at ECDX by Tyler Shaw – Prints Charming. 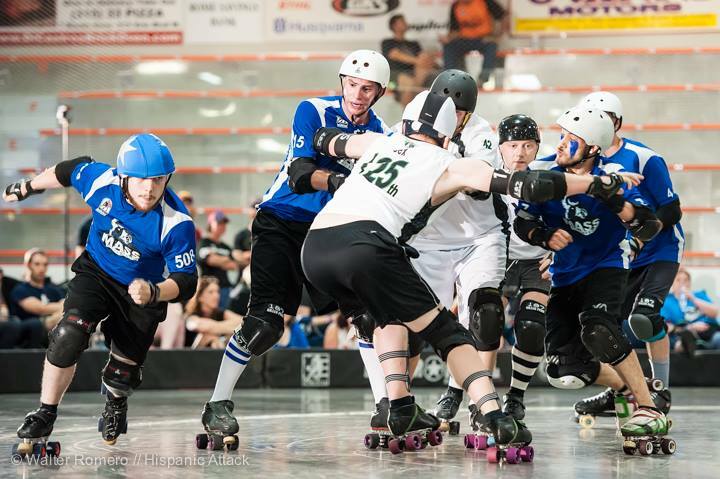 Maelstrom’s first bout of Championships is against an old, familiar face: New York Shock Exchange. This will be the second year in a row that Maelstrom will face NYSE a total of 3 times [in 5 months]. 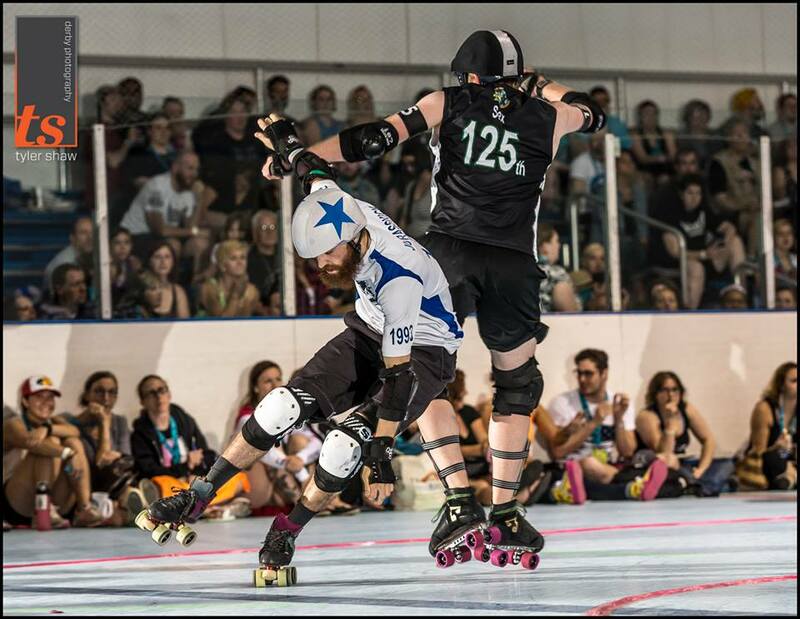 Last year, their final match-up of the season was at the Mohawk Valley Cup, in the finals, and Maelstrom took the win by 20 points after having lost the previous two match-ups. The first round of Champs could prove a similar Cinderella story. At ECDX and Mohawk Valley this year, NYSE proved too dominant for the Vikings. Despite not having a “full strength” roster, Mass does not consider themselves out of the competition. With two bouts against NYSE under their belt, and with the return of Coulter and Pickering to their bench, Maelstrom is restored to much of it’s 2013 strength. Both vet and newbies to the roster are ready for the classic rivalry match-up in the first round. 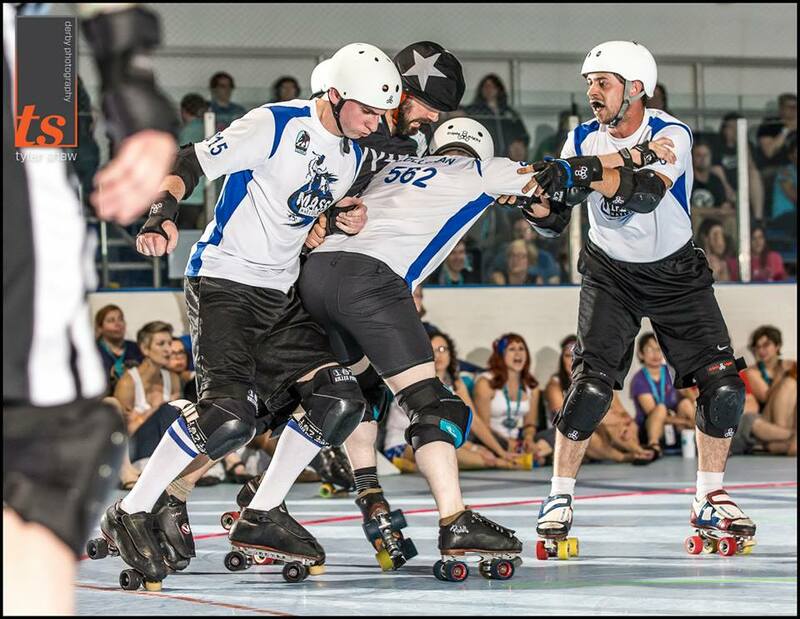 Vet Colleran holds onto returning skater Deep in Cider, while Velawesomeraptor and Mikeopathic Chiller hold the inside line. Mohawk Valley Cup. Photo by Hispanic Attack 2014. If you love Vikings and want to pick up merch, get info on upcoming clinics, or just to follow their season, you should definitely check out their Facebook page. 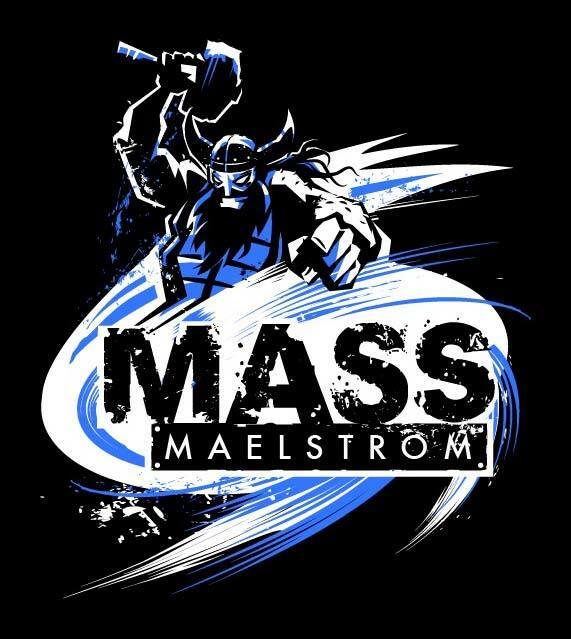 Also, Mass Maelstrom has some wicked rewards going on right now on the MAELSTROM GOFUNDME so … Go Fund Them!! 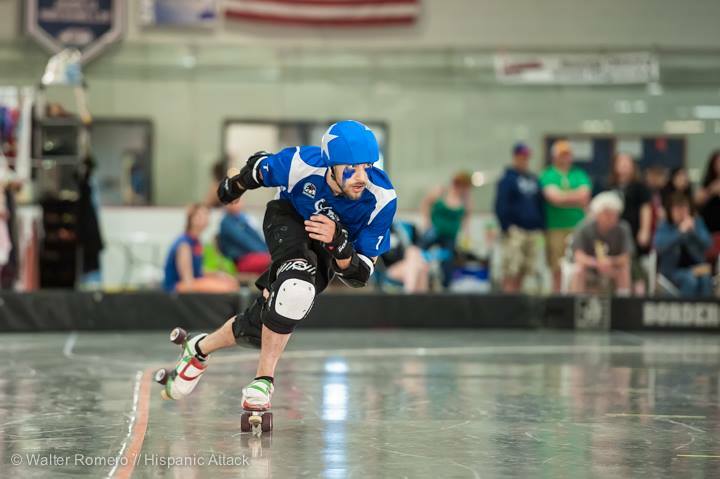 And make sure you tune into WFTDA.tv all weekend to watch the 2014 MRDA Championships. Thank you to Tyler Shaw and Hispanic Attack for the photos used in this article. No Big Deal takes the outside lane at the championship bout of Mohawk Valley Cup. Photo by Hispanic Attack.